New in November 1956, L255 was one of a batch of 65 Leyland Titan PD2/20 chassis that had been ordered back in 1955, partly to enable the 19 & 44 tram routes to be converted to bus operation. It was originally painted in the Dark green livery with two cream bands. When new L255 was allocated to Carnegie Road garage, but its stay there was only short lived as it was transferred to Walton in March 1957. There it was used on routes such as 19/44/92/93 serving the new expanding housing estates of Kirkby, Southdene and Tower Hill as well as the Corporations own Kirkby Industrial Estate. where it lives today! When Walton closed for rebuilding in October 1962, L255, along with the majority of Waltons allocation moved to the new Gillmoss garage . Following overhauls in 1966 and 1971 it returned to Gillmoss. It then moved to Litherland garage in August 1973 and saw use on services 28,51,52,53,55,55A,56,57,57A,58,59 to Ford, Netherton and Sefton. L255’s stay at Litherland was a short one as it was transferred for the last time in April 1975 to Green Lane. There it was used mainly on peak hour extras and industrial workings until it was finally withdrawn from service in March 1976. Purchased for preservation in May 1976 and joined the other vehicles in the growing Mersey and Calder Preservation group in 1977. As L255 was in basically good condition it was soon rubbed down and painted back into the early 1960’s livery of green with cream staircase panel and window surrounds. In 1996 after more than 20 years in active preservation and with more than 25 years since a major overhaul, it was time for some major body restoration. After stripping every external panel off the bus, it was soon found that there was a fair amount of work involved. Following a flurry of activity in early 2007, L255 was eventually completed finally passing the MOT 2 days before the Mersey Transport Trust’s annual running day in September 2007, proving a popular attraction during the day. During 2009 a rechromed drivers window surround was fitted and in 2010 side adverts were added much improving its appearance. It is seen at the 2014 Kirkby running day. Totally agree Chris. Much better looking examples of what was a PRV design were operated in the North West by Oldham and Stockport. When compared to other tin fronts of the period, the front panel and the area around the windscreen, give it a sort of DIY in-house accident repair appearance, rather than one that was built that way in the first place. There is a lot of confusion about Crossley bodies of this period. Despite employing the PRV rear emergency window, I don’t believe this was the PRV design (as supplied later to Stockport and Oldham), and neither does the Crossley book (Eyre Heaps & Townsin). Mind you, that book isn’t foolproof; identical bodies supplied to Darwen are coded as the PRV design, while those supplied to Sunderland are coded as a Liverpool design. The flat front to the upper deck is something specifically requested by Liverpool and used on Crossley bodies elsewhere. The standard Midland Red assembly would not have allowed this, and in fact later Liverpool bodies with the Midland Red assembly had bow-fronted bodies by Duple and Alexander. As the owner of the bus, I can confirm that the Crossley body is of Park Royal design, I have restored both L255 & Park Royal bodied Barrow 170 CEO 957, the only difference being the window frames. Liverpool using glass mounted from the inside with a window ledge inside as against the Standard Park Royal body on 170 with windows mounted from the outside with a ledge outside. The last true Crossley designed body supplied to Liverpool was L224, L225 to L244 also carried Crossley framework but the coachwork was completed by LCPT at Edge lane works. I hope this clarifies it more. Thanks for your clarification, Rob. It probably means I’ve been spouting rubbish on various forums for some time, thanks to believing what experts write in books. One thing that fooled me (not clear in this view but there are plenty of other photos around) was the small rectangular windows in the front bulkhead, which Crossley had used on their own-framed bodies. On other Park Royal-framed Crossley bodies the bulkhead is the standard Park Royal type with a deeply arched lower rail to the windows. Perhaps this is again due to the different glazing system used for Liverpool (and Darwen, Sunderland and Aberdeen). A quick scan on SCT61 pages suggests that Liverpool specified that size of front bulkhead window on all their contemporary Leyland deckers be they Saunders-Roe, Duple, Alexander or Crossley bodied. On Stockport’s Crossley bodied Leyland deckers with PRV frames the bulkhead window bottom rail does follow the line of the engine cover but it, and those on the next batch of Longwell Green bodies, is still a very narrow window (made to look even more so by the top opening vent) compared with that fitted to their later East Lancs bodied St Helens front PD2s. Liverpool made a habit of taking framed chassis from the likes of Weymann and Crossley but then changing the profiles. There were some very odd Weymann/Liverpool bodies on Regent IIs with an upright profile which ruined the general style of the Weymann original – and I believe they also had non-Weymann upper deck tear emergency exits. Even the Met-Camm Orion Regent Vs were not standard Met-Camm. That accolade went to the the famous Nottingham PD2s famous because they were the first Nottingham PD2s. …..and of course there were the 1949 all Crossley DD42s that Sheffield acquired new as a cancelled Liverpool order. These were neither the popularly remembered Crossley outline, nor did they have the PRV framed body. These were identical to the Regent IIIs and the first Regent Vs which Liverpool took delivery of and kept hold of. Although L255 is obviously based on the PRV design, there are also elements of the earlier design around the front (especially upper deck). Hopefully a rather extensive restoration of Barrow 170 will be completed soon by the Barrow Transport group. So I hope that when it ventures to our NWVRT Open day at Kirkby (plug 31/5/2015)we can get them parked together to record similarities. Another Park Royal trait that L255 carries internally is the pressed out lighting mounts along the cove panels in the upper saloon ,just like the ones on 170 & Park Royal bodied Liverpool E1. The Crossley Bodies AEC’s and the Liverpool PD2’s up to L224 had their lights at the edge of the ceiling . Was this a standard Crossley practice ? I now have to eat some more of my words. 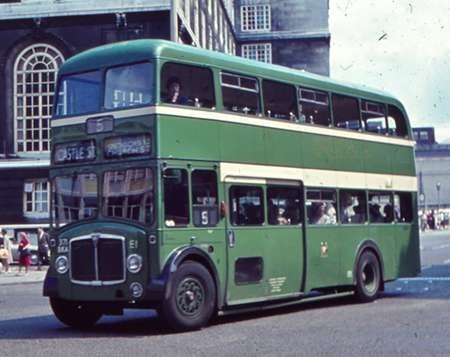 Earlier I said that use of the standard Leyland (originally Midland Red) bonnet assembly would not have allowed Liverpool to have their much-loved flat-fronted upper deck. I got this idea from Alan Townsin’s Duple book, which says that the uncharacteristic bow fronts of the Duple bodies on L91-140 were dictated by the design of the Leyland tin-front. I also think I have solved the conundrum of the bulkhead window. Other photos of L255 show it to have a much wider bulkhead window than the Crossley-framed bodies, and the reason for departing from the standard PRV window was almost certainly the rearward-facing seat behind the bulkhead, which I had forgotten about. I have reverted to my earlier belief that other Crossley bodies with the narrow window (Darwen, Sunderland, Aberdeen) were Crossley-framed. I thought I had a photo of a Liverpool Crossley DD42 and have now found it. C642 taken at Pier Head on July 5, 1962, still in cream bands livery and by this time only appearing on school, university and short workings. Liverpool City Transport’s A40 can reasonably be stated to be a unique bus. 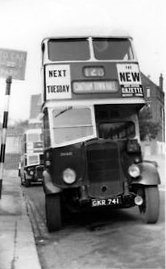 As far as I can make out, it was one of just two double-deck buses for the UK market with bodies built as a Saunders-Roe product (the other being its twin, A39), and to make it unique it carries one of the small number of unpainted bodies ordered by Liverpool with the intention of using them on limited stop services. 40 were originally envisaged, but the idea was dropped and in the end only 18 appeared as such. These bodies are not painted silver, but the panels have a textured natural aluminium finish. It’s not clear whether this in practice reduced maintenance or repaint costs, but all of them retained the unpainted finish to the end of LCT days at least. Because of the texture to the finish, it would not have been possible simply to paint over the original panels, so to change livery would have required a complete repanelling. Despite the tin front, this is indeed a Regent III, one of the large batch of 100 delivered between 1953 and 1955 during the tram replacement programme. Apart from the two from Saunders-Roe, the remainder were either built by Crossley or finished by Liverpool on Crossley frames. Horne and Maund’s epic treatise on Liverpool’s Transport doesn’t give any reason for the two bodies being ordered from Saunders Roe. Doing some investigation into Saunders-Roe, I did discover that following the takeover of Crossley by AEC, a number of design staff transferred to Saro. In view of Liverpool’s close relationship with Crossley, I wonder whether there was some sort of insider dealing going on. Interestingly, the Saro bodies, being of all-aluminium construction were about one ton lighter than the Crossley ones, and additionally had 2 extra top deck seats, both of which might have been considered significant advantages. The reduced weight should have led to fuel economies, but the main factor could have been first cost of the aluminium structure. In the course of my investigations I also put to rest a misapprehension about Saunders (of RT fame) and Saro (of the Tiger Cubs). I had always been led to understand that the two were separate organisations. In practice Saunders, Saunders Engineering and Shipbuilding (SEAS) and Saunders-Roe (Saro) were simply successive marketing names for the bus building operations of the Saunders-Roe group at Beaumaris. What was A40 doing in Manchester’s Hyde Road Garage? 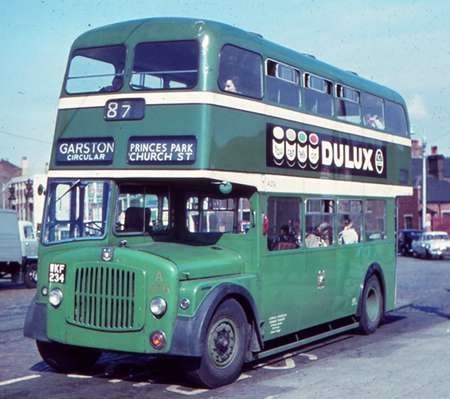 The answer is that the Liverpool University Public Transport Society (LUPTS) had organised a trolleybus tour of the Manchester and Ashton system on 12 June 1966, and this was the vehicle selected to ferry the Liverpool contingent to and from Manchester. The bus was certainly made to show what it could do along the open spaces of the East Lancs Road. This second view is a fuller shot of the bus showing better detail of the Saro body, waiting to start from the University Students’ Union in Liverpool. As can been seen, it was normal British summer weather, but remarkably the rain had ceased by the time we arrived in Manchester (!) for the main tour, and at one point the sun even tried to come out. Well, A40 certainly stands out against the red and cream residents! I, too, have often wondered where Saunders, Saunders Roe and Saro fitted together. I presume there is no connection with the rather more popular Roe of Crossgates, Leeds! Alan. Even allowing for your self-correction in paragraph two, there were many deckers from Beaumaris. The 250 RTs were preceded by OKM 317 which was operated by Dodd’s of Troon and used as a test bed for the said RTs. Devon General, like many others, had a programme of rebuilding after the war. DR705 (ETT 995) used the chassis of a 1937 AEC Regent with parts from a 1938 Regal with a new (1953) Saunders-Roe body. Don’t know how many, if any, more Saunders-Roe bodies emerged in this programme. It was certainly a extensive one but most of the new bodies were by Weymann and extended to 1954. They were known locally as "Light sixes". Were there any more? Over to you out there…..
South Wales Transport had a number of Regent Vs which were unpainted. I well remember them in their first year in service when on a visit to South Wales though my main memory from that trip is a ride on the Swansea and Mumbles Railway or Tramway – both terms were used – with two double decker trams coupled together, something I hadn’t seen in Blackpool. I seem to remember the Regents were repainted so presumably their panels were to a different finish. I was never a fan of the Liverpool Crossley or Saro bodies to this design, I thought, and still do, that they are visually utilitarian. "Since 1958 our company has been experimenting with non-painted buses to ascertain whether there was any advantage in operating buses of this type. Altogether, we had 13 such vehicles, six were acquired in 1958 and a further seven in 1959. It would seem, however, from the records that while the unpainted vehicles offered certain advantages there were disadvantages which in relation to costs of maintenance, showed that over the experimental period there was very little to choose between the painted and unpainted vehicles. For instance, the unpainted vehicles have received considerably more than normal cleaning to maintain an acceptable appearance. The cost of which almost cancelled out the saving made in the non-painting of the exterior. The unpainted vehicles, when requiring body repairs after accidents, did offer certain advantages, severe damage, which necessitated the complete replacement of a panel was facilitated when no painting was required. However, there were disadvantages in this respect too, minor dents and scratches which could be filled and painted on an orthodox finish, invariably necessitated the changing of the panel, as the effect of even the most highly skilled panel beating was still visible. There being little to choose on actual cost, the final decision evolved over the appearance of the vehicles and it was felt that the painted bus was considerably more attractive, so it’s back to the redskins for us." Avro (AV Roe & Co), the Manchester- based aircraft manufacturer, was founded by Alliot Verdon Roe. Later ejected from his own company by bankers, he took an interest in Saunders of Cowes in the Isle of Wight – a flying boat builder – which then became Saunders-Roe. On the subject of double-decker buses, have we all forgotten the Leyland PDR Lowloader? One of the two prototypes had Saunders-Roe bodywork. Then there were the vehicles built under contract from MCW in the 1960s. Well yes, to my shame, Neville, I had forgotten the Atlantean/Lowloader but tell me, I’m intrigued, about the MCW sub-contracts. While Charles Roe s had no connection with A V Roe. Leeds was home to a shadow factory in world war 2 that produced over 700 examples of the world famous Lancaster bomber. The factory was next to what is now Leeds-Bradford Airport and was heavily camouflaged to the extent it had the roof grassed over and live sheep on top! Thank you, David O. I didn’t think there was a connection, but one never knows! Been travelling all day so missed much of the above until now. I’ve never got to the bottom of just why Leyland went to Saunders Roe for the body for the Lowloader. In 1953 they were still building bodies though the thought may have been that they wanted continuity and the writing was on the wall for their own plant. Given that, why didn’t they go to MCW or, closer to home, Northern Counties? Perhaps they wanted to keep things as quiet as possible for a while and chose SARO for its remote location, relatively few customer visitors and in the knowledge that the order would receive detailed and deep attention from a company at the time looking to increase its business. Can’t help noticing the body on A40 has a very strong resemblance to the Northern Counties 4-bay bodies on tin-front PD2’s operated by Lytham St Annes and Oldham. Some musings on Phil’s comment on the Crossley bodies of the same batch of Regents. Personally, I always felt that the 8ft wide bodies on the first batch of Regents (A757-806) were not unattractive. The body was not enhanced by the addition of the first Liverpool-style tin front. The final version of the Crossley body, and particularly the final version of the tin front, were distinctly retrograde. What is undeniable is that the final livery of overall green with just the central window surrounds in cream was a recipe for making any manufacturer’s body look utilitarian. Even the early two-band livery didn’t do a great deal, so that even the Leyland bodies – one of my favourites – was made to look pedestrian in comparison with some other operators (e.g. the one across the water). My view on this earlier livery may well be influenced by the fact that the relatively few vehicles still carrying it when I became familiar with the fleet would already be some years out of paint shop, and that version of the green was notorious in not meeting old age gracefully. The very last vehicle to retain that style, the evaluation Atlantean E2, was reckoned to have no two panels of exactly the same shade of green towards the end. It was a real patchwork. Now the A. V. Roe part of the equation has been settled, what about the Saunders part? There was a Saunders Eng & Shipbuilding at Cowes Isle of Wight which merged in 1948, with Avro, but Cowes is a long way from Beaumaris. The 300 Saunders RTs were delivered from 11/48 until 2/51. M&D had a batch of Saunders-bodied K6As (DH204-243, JKM 901-940 delivered in 1948 which had a Weymann-look about them. Where were these built? Then there was a 1942 K5G (DH445 GKR 741) which had a Saunders body built in June 1950. This was definitely based on the RT body behind the bulkhead, even to the interior trim and top rear emergency exit. Was this body tucked into the RT production run or an experimental body using Rivaloy construction? Also, the AA AEC Regent III (OKM 317) built in 1951 as a prototype for future production, though apparently registered to M&D in 1951 but not used by them but as a demonstrator, but was it for AEC or Saro? Further, M&D also had a Saro semi-chassiless bus in 1953 (SO68 RKE 540) with Gardner engine, but I don’t know who supplied the gearbox and other running units. It appears to have been still-born because I can’t find any similar vehicles ever being built. All the vehicles mentioned (and all the Tiger Cubs for Ribble, etc) seemed to have full service lives, so it seems odd that this manufacturer had a relatively short flirtation with buses. Over to you gentlemen to explain this lot!! There is a book in existence "Saunders Roe Ltd, Builders of the World’s Lightest Buses" by Gerald Truran published by Bryngold Books (Wales). Not sure if it is still in print as it isn’t listed on their current web page. This was written by a former employee. All Saunders Roe buses were, as far as I’m aware, built on Anglesey. We all ought to go away and look at Wikepedia about Avro and Saunders Roe. It otherwise needs a complete article. These companies- and others- seemed to survive by doing a bit of this and a bit of that- often innovative- and occasionally a Helicopter or a bus would come good. They merged and unmerged and reorganised like primitive life forms. AV Roe himself seems to be a consistent element. The thing that doesn’t seem to have appeared here and put me right if I’m wrong is that one factory was built next door to Crossleys and when AEC took over Crossley, a number jumped ship and so bus expertise was acquired: so was the Lowloader related to the Crossley chassisless bus? And then the riveted aluminium buses for export…. you can get an idea of our manufacturing problems-these were flexible companies with eggs in many baskets…. like Tatra? Joe, Crossley’s factory was at Errwood Rd Stockport, Cheshire. SARO’s was at Beaumaris on Anglesey so those who moved to SARO had to move house. I’m not aware of any linkage between the chassis/engine/drive train used by the Lowloader and anything Crossley. As far as I know, only the body was SARO and the assumed linkage on the Wikipedia page could well be speculative. There is a connection between Crossley Motors and AVRO. From 1920 to 1928 A V Roe and Company Limited was owned by Crossley Motors and it was at the end of this period that A V Roe left the firm he had founded. He sold his minority share holding in AVRO to J D Siddeley, of Armstrong – Siddeley, the company Crossley had sold its majority share holding to. Armstrong – Siddeley’s aircraft interests became Hawker-Siddeley (of Hurricane fame) and AVRO was a separate subsidiary of this organisation. A V Roe used the proceeds from the sale of his AVRO shares to buy a controlling interest in Saunders Aircraft of Cowes, which was renamed Saunders-Roe. Saunders-Roe had a factory at Beaumaris, which became the base for their bus body building activities using at various times Saunders Engineering and Shipyard (SEAS) and SARO. Here’s a photo of Saunders Ship. & Eng. yard at Beaumaris, in 1949, with bus bodying in full swing!. The chassis without platform extension are those of RT’s. 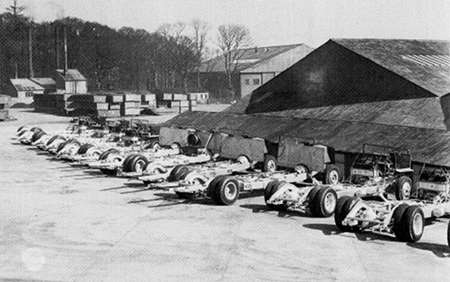 The four chassis with extensions, in the centre of photo, are those AEC Regal III’s." Yes I misspoke Phil… I was confusing Crossley taking over the Avro works in 1920. But Wikipedia does say that after AEC the design staff from Crossley went to Saro, hence the Lowloader had Crossley connections! That could make sense? Phil: I’ve looked at the Bryngold website and the Saro book is listed about two thirds of the way down the list of titles on the right of the page; this opens a separate page relating to the book, and there is no suggestion that it is unavailable. Knowing Gerald Truran’s voluminous knowledge of all things Welsh in the bus world, he may well clarify the reason for Saro working on the Lowloader project. My own guess would be that Leyland were looking to build on the experience Saro had with chassisless aluminium construction with the Tiger Cubs, which were definitely not failures. Incidentally, the Bryngold page has a picture of the bodyshop with an undeniable Bristol half-cab (without much body structure) which set me wondering until I saw Ray Stringer’s comment above referring to the M&D batch, which I had been unaware of. Joe, That could be but it’s a bit tenuous as Crossley’s staff who moved and worked on the Lowloader would have had little, if anything, to do with the Bridgemaster development as work on the Lowloader design at SARO commenced in 1951 and Crossley’s involvement with the Bridgemaster was from 1953/4. Alan, Thanks for the info. When I went into their site yesterday the page obviously didn’t load properly as the sidebar was missing. Could you expand on your comment re chassisless construction and Tiger Cubs as the Cub had a chassis? Phil: My comment on the Saro Tiger Cubs was something that was sitting in the back of my mind rather than based on something definitive. I’ve done some checking up in my limited library, and two things have become clear. Firstly, the Saro Tiger Cubs were clearly conventional chassis, and secondly that the chronology does not support my guess, as the development work on the Lowloader (source: The Leyland Bus) predated the Cubs. Moral: engage brain before opening mouth! It’s interesting to see that one of the demonstrator Cubs – part of the Ribble order – had a Saro body. The Leyland Bus doesn’t comment on the choice of Saro, but both Tiger Cub and Lowloader were small engine vehicles, so the weight saving of an aluminium body would be a key factor. One wonders why they were not more widespread – was it higher first cost, operator conservatism or capacity at the Anglesey plant? Returning to Liverpool’s A40, it’s interesting that Liverpool specified a textured unpainted aluminium. This seems to have, whatever it looked like, a durability the South Wales Regents never attained. In Gavin Booth’s Buses By Design there’s a picture of an ex-works South Wales Regent taken at Addlestone and the panels are very obviously smooth. He comments that the finish swiftly tarnished and the buses were all painted. Like Alan, I have always assumed that the reason for the choice of Saunders-Roe to body the first Lowloader prototype was weight-saving, given that the bus was to be used for demonstration and needed to impress with its performance. By the time the second Lowloader was built, MCW’s lightweight construction had been developed. Guy also used Saro for its Gardner 5HLW-powered Arab LUF demonstrator, perhaps for the same reason. I have read that Saunders-Roe’s early departure from the bus body market was due to a policy decision by the company rather than any lack of customer interest. I have always been given to believe that all operators of Saro buses spoke highly of their quality. They were an "off-shoot" of an existing business and presumably not core to it. Being involved with Liverpool A40 in the early part of its restoration, it certainly had (as was stated earlier) a good power to weight ratio being over a ton lighter than similar Crossley bodied Regents. Bodywork wise too it was much more solid than its Crossley steel framed counterparts. The only body restoration that has taken place in preservation on A40 has been a platform bearer! Notable when its parked next to a London RT is the RT style emergency window! Great to see the old LCPT AEC A40 – these were known to school kids as "ghost buses". My cousin was a big bus fan, and used to be keep me clued up on fleet developments. 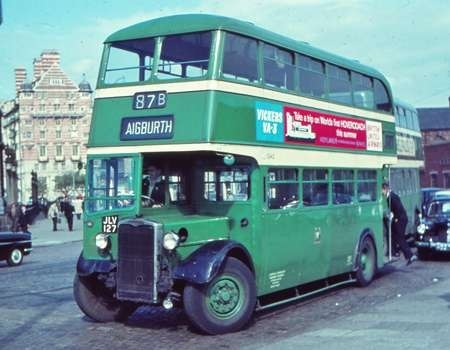 A40 was well known – used to operate sometimes on our local route, service 61, Aigburth Vale to Seaforth. This would be around 1958-60? Correction to my comment 02/01/13 – 07:23. The Saro-bodied Guy Arab LUF demonstrator still exists and apparently has always had a 6HLW engine, much to my surprise. Going back, again, to Peter’s post nearly a year ago, it was a policy decision to withdraw from the passenger market but there was a post-script. Saunders-Roe eventually became a Cammell-Laird possession – and therefore in common ownership with MCW. MCW, not for the first time since closing Weymann down, found itself short of capacity. It solved this by putting orders for Atlanteans for Devon General to Saunders-Roe. Picking up on the later MCW/Saunders-Roe connection, Brighton’s 1968 PD3s were also built at Beaumaris – there’s a picture of a couple under construction in a 1971 Brighton Corporation Transport fleet history published by a body called E.L.P.G Enterprises (Eastbourne Lion Preservation Group?) It also states that only 21 other bus bodies, apart from these, were built during the short-lived return to bus body building on Anglesey – "ten for the home market" I assume the DG Atlanteans David refers to "and eleven for overseas" – no idea what those were. 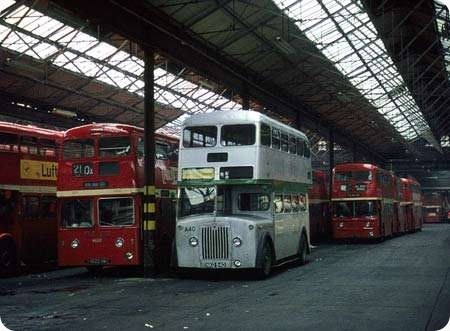 a) 1968 Beaumaris home market production was 5 PD3s for Brighton and 10 Atlanteans for Devon General, as stated above. The other 11 vehicles were bodied under licence from the Superior Coach Company of America, on Bedford VAM chassis. The first was in the Demonstration Park at the 1968 Commercial Motor Show,no other details given; the other 10 were assembled on left hand drive VAMs and sent to the Middle East for use by an oil company. The final passenger carrying body produced at Beaumaris was a Superior body, on a Ford D series truck chassis, owner unknown. b) Apparently Leyland approached Saro to build an all aluminium lightweight body for what became STF 90. No reason is given for Leyland approaching Saro. ULW is given as 6-17-3.
c) The first double deck bodies built at Beaumaris were rebodied TD3/4/5s for Southdown – AUF 660/1, BUF215/7/28/35, EUF 183/6/99, with features specified by Southdown. d) Maidstone and Dist JKM 901-40 were built at Beaumaris in 1948, the last vehicles to the pre-war Short Bros design. e) Maidstone GKR 741 was the first double deck Rivaloy body, resembling the RT body. f) OKM 317 – is given as used by M&D as DH500, later to CB Law of Prestwick, and Dodds of Troon. g) RKE540 Saro body and underframe – given as Gardner 5HLW engine,David Brown 5 speed gearbox, ULW 5-17-3.
h) Devon General ETT 995 was the only Saro Light Six – it is in preservation in the West Country. I can thoroughly recommend the book, a fitting tribute to Saro, and to Gerald Truran, who researched it, but sadly passed away before it could be published. The Bedford VAM with the licences built body that appeared at the 1968 show was a right hand drive facsimile of an American school bus . MCW hoped to interest local authority education departments and independent operators but both markets were disinterested as it was cheaper to use non dedicated vehicles. Also, by any UK standard, the vehicle was spartan. Here’s a frontal view of Maidstone & District Bristol K5G DH445 (GKR 741) from 1942, with a 1950 Saunders H56R ‘Rivaloy’ body (ex Chatham & District). Ray Stringer mentions that body was based on the RT body from behind the front bulkhead, even to the interior trim and top rear emergency exit and wondered if the body had ben tucked into the RT production run, or was an experimental body using Rivaloy construction? Bob Gell quoted that Maidstone GKR 741 was the first Rivaloy body, resembling the RT body. Unfortunately, the view does not show the body behind the front bulkhead, but certainly does not reveal any RT resemblance at the front. What a shame they skimped on putting a PV radiator on it at re-bodying. Definitely a case of spoiling the ship for a ha-p’orth of tar! Liverpool’s A40 always had a mystique about it, more so than its companion A39, because it was unpainted. A40’s interior had a much more luxurious feel than the other 98 Regent IIIs in the batch and even A39, perhaps partly due to its moquette seats, something highly unusual for the Liverpool fleet. Good to know that the vehicle is preserved. As a young lad who couldn’t wait to work for YTC (Yorkshire Traction) I well remember the company taking delivery of two dozen Saro Cubs GHE 2 to GHE 25 1002/1025 and were put into service immediately in Battleship Grey but with fleet numbers and Yorkshire Traction emblasened on the side. Evidently the paint shop workers at Saro were on strike and YTC were in the process of disposing of an old fleet of PS1’s so they went into service in grey but were later called in and painted in reverse livery where the main colour was Yorkshire Cream then later to Traction Red. Reference the sliver bus in the above photo. These buses were used on route 510 limited stop. We called them slice bullets because they were fast and had good heaters. I felt like a king when I drove this bus on route from Liverpool central to Prescot. Many a person got on the bus but they tried to get off nearl killing them selves when the driver had to stop at the traffic lights. I passed my Psv on a crash box, the instructor used to take out the window behind the driver and shout at you get off the brake, feather the clutch and so on that why most of us are now deaf. A unique radiator grill I think don’t know why as the standard grill looked much better than this tin look. I also think how much better the livery would have been if there was a nice cream band between the upper and lower deck, there was far too much green on Liverpool buses. 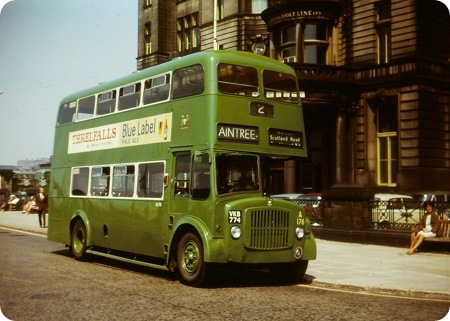 The original livery had a cream band right round the bus just above the lower deck windows, and a narrower, similar one below the upper deck windows; the green was also darker. The livery in this picture dates from about 1964 I think. Some of Aberdeens Gardner engined AEC Regent Vs also sported this type of grille. This type of grille was very common in the 1950s on AEC Regents and on Leyland Titans. Known colloquially as a ‘tin front’ the style was common to Regent IIIs and Regent Vs in the Liverpool fleet, 292 of them in all (A1-A292) , and from memory around 300 Titan PD2s. Very common too on Midland Red and Glasgow Corporation ‘deckers. The ‘City of Liverpool’ name was not added to the coat of arms till 1965. 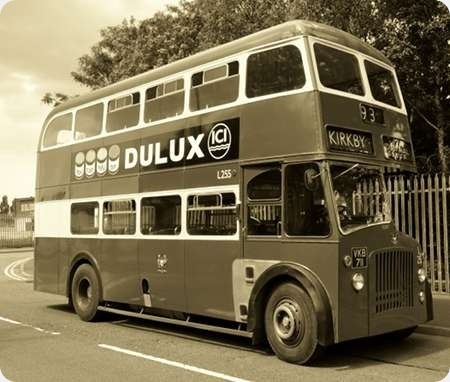 I remember these well particularly running on routes 4 and 5 from South Castle Street to Woolton, and the 4b and 5b from the Pier Head to Penny Lane. On the 4 and 5 routes, they were able to get up to a fair old speed along the dual carriageways of Menlove Avenue between Penny Lane and Woolton. The 4b and 5b ‘belt’ routes ran out to Penny Lane via Wavertree and Smithdown Road respectively, then changed route number to run back to the city centre the other way, both quite heavily trafficked routes. The Penny Lane terminus was near the ‘shelter in the middle of a roundabout’ made famous in the song, also the terminus of the 99 to Lower Lane, the 42 to Edge Lane, the 71 to South Castle Street, the 77 into town and the 46 to Walton, on which I recall for a while seeing the two single deckers, SL175 and SL176. Not strictly about this bus, but the AEC Regent V D3RVs of Liverpool had one similarity to AEC Regent III 9613A A757-806 – the gearbox sound. Although the A757 etc batch were described as 9613As they had synchromesh gearboxes, and the later batch A1-100 were 9613S. AEC Regent Vs A101-292 and Bridgemaster E3 all sounded the same. Herewith the original Liverpool livery on this type – taken at Pier Head on 5/7/1962. At this time the cream only around the windows (to make masking for spray painting quicker, I was told) was already well under way. It always looked to me that the bottom half of the vehicles were repainted more often than above the lower deck windows. 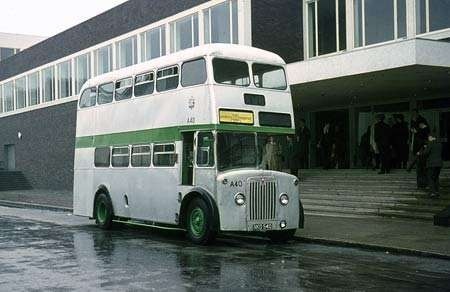 As an afterthought, I have also included the one and only 30fter AEC in the same livery taken at the Adelphi 26/6/1962.